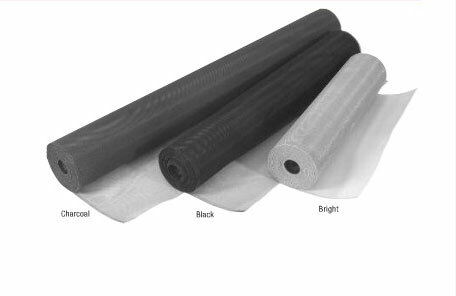 Examples of Charcoal Fiberglass Mesh, Black Solar Mesh and Bright Aluminum Mesh Rolls. It is hard to consider what we would do without screens on our windows. Screens are simple items that make a big impact in our lives. They prevent flies, bugs, dirt and other wind-borne debris such as leaves from getting into our homes. With Southern California’s weather they allow us to open our windows and enjoy the breeze. If your screens are frayed from sun exposure, are broken due to being removed over the years or if they have holes or tears in them National Glass is your stop for experienced window screen replacements. When you bring in your old screens or call with your screen details we get to work, cutting your new frames onsite at our facility and then inserting your choice of screen mesh by hand. Standard Fiberglass Screen Mesh in gray or charcoal. Solar Screen Mesh for increased energy efficiency. Pet Mesh for windows within reach of our four legged family members for Santa Clarita's dog and cat lovers. Real Aluminum Wire Security Screen Mesh for increased safety and durability. Whatever your screen needs feel free to stop on by with your existing items or call us to discuss your options!